Still Plays Video Games: Wednesday Hottie Slacker! Oh yeah, we've been just horribly, terribly, unforgivably not keeping up with our CyberGeek Hottie of the Week / Month / Whatever. Geek Girl Diva to the rescue, as she puts up a cleavage shot for a good cause, Breast Cancer Awareness. It is terribly unfortunate that I couldn't make it to SDCC for their signing, and early on, I threatened GGD with being suckered into the spotlight of Hottie of the Week. Now, without warning! She's it, *tag*. 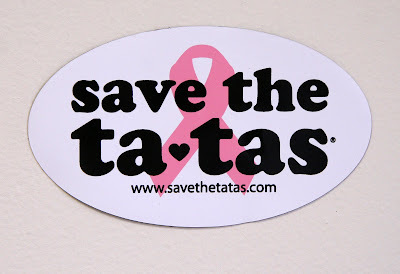 Oh yes, and savethetatas.com, though tongue in cheek, is serious business, do check their site out, buy some merchandise, throw it on the bumper or whatever.